It had been one of those weeks when all I wanted to do was change my name, crawl under a rock to hide or most preferably: BOTH. Fridays are my freelance days. I work from home, on my own schedule, and sometimes that means disappearing to find a couple hours of quiet. Quiet was definitely in dangerously short supply by the end of this week. For the first time in long time, I walked out towards Stratford Point. Being a weekday and a bit on the chilly side, I had the entire beach to myself. I had been hoping to get my favorite spot below the lighthouse but the tide was up and my last quarter mile was completely under water. I found myself out of beach at the foot of a massive concrete retaining wall, the base of which was buttressed by large boulders. It was a perfect place to finally sit and rest. I had nowhere else I needed to be and had shaken off the stress of the week on my walk out there. I listened to the waves crashing at my feet and felt the sunlight wrap around me. The nagging Gremlin voice in my head, for once, had been completely silenced. The immensity of that gift is beyond words. That stretch of beach has a vast array of large stones scattered about. 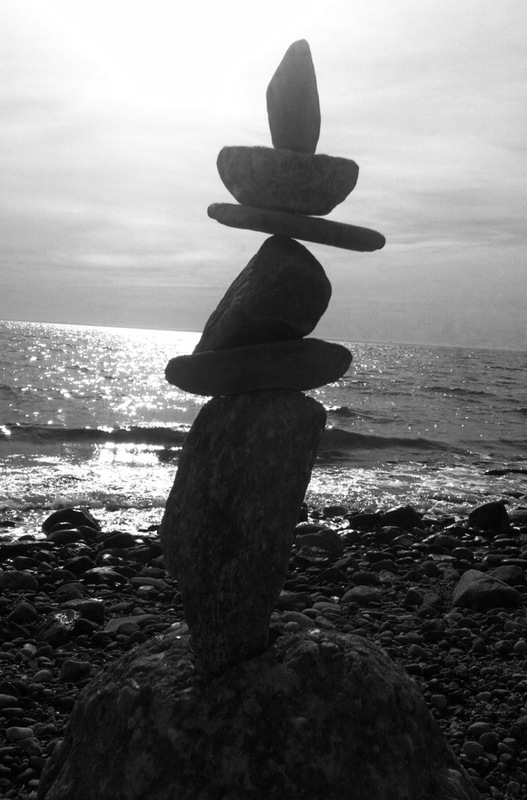 Often times in the summer, I bring my sons down to this part of the beach around sunset and this past summer we started experimenting with balancing stones. Being boys, they were rather fond of balancing them for the sole purpose of knocking them down again by throwing baseball-sized rocks at the towers. It could be a painful experience for anyone caught in the crossfire. As I sat there, it suddenly occurred to me that I had never come down to balance stones on my own. I could actually take my time finding the perfect stones and balance them as high as I chose without worrying about the boys accidentally stoning each other while my back was turned. That was too good to pass up. I started out with a few smaller towers but they kept shifting and falling. I decided to work with larger stones, some weighing at least 20 pounds or more. But again, as the tower rose, the stones would shift and fall. I learned the hard way, as I seem to learn nearly everything, that trying to catch large, falling stones is a really, really dumb thing to do. Frustrated, I retreated to my spot on the boulders, rubbing my smashed fingers, knowing they’d be black and blue later. I love mechanical puzzles and I have a wicked competitive streak. I often time myself with a new puzzle, then try to beat my best time with each consecutive attempt. That was the way I had approached the stones. I had tried to build higher, faster, concentrating not on each stone but on an image of what the end result would be. That was why I had failed. Balancing stones requires patience, not exactly my strongest virtue. I knew I needed to try it again. Slowly, this time. As I balanced the first stone on its pointed end, something happened that I had never noticed before, a vibration in my hands that stopped as the stone settled into place. With each subsequent stone, I felt the same vibration and I could feel if the stone would balance or fall. More than that, I could feel when the lower stones were about to shift out of balance. Sometimes that meant discarding one stone in favor of another so as not to topple the entire tower. Wait for the stone to be still. Only then could I let go. The end result was impossibly balanced. Many of the towers I’ve built in my life went up too fast or on shaky stones. Except in life, when I tried to catch what I should have let fall, I smashed far more than my fingers. As C.S. Lewis said, ‘Experience: that most brutal of teachers. But you learn. By God, do you learn.’ And I have learned. I feel the vibrations as it seems it may be time to discard one stone in favor of another and I know I need to wait for the stillness before I can let go. I have no idea what the final result will be, but I know that somehow it will be impossibly balanced.